The J.L.A. Tanach program includes a wealth of instruments for Tanach research. Besides the common search functions for text and numerical values there are multifarious cabalistic and ELS-Code ("Bible code") search functions. Twenty eight analysis functions analyse the Bible text, e.g. according to identical and reverse passages, to word lengths, verse lengths, chapter lengths, book lengths, word values, verse values, etc. Professional Tanach researchers can make most unusual search operations thanks to a module with 178 programming commands. Four Tanach versions are included: the standard text, the Westminster Leningrad Codex, the Biblia Hebraica Stuttgartensia 1997 and the Aleppo Codex. A grammar of all Tanach words is included. The King James translation and the Septua Ginta run parallel to the Hebrew text in all program phases (can be switched of). Also the King James Apocrypha are included. The program includes a timeline, a topography with interactive items (two maps), a database for numerical values of uninflected primitives (9000) and many other functions. Chapter headings, search results etc. 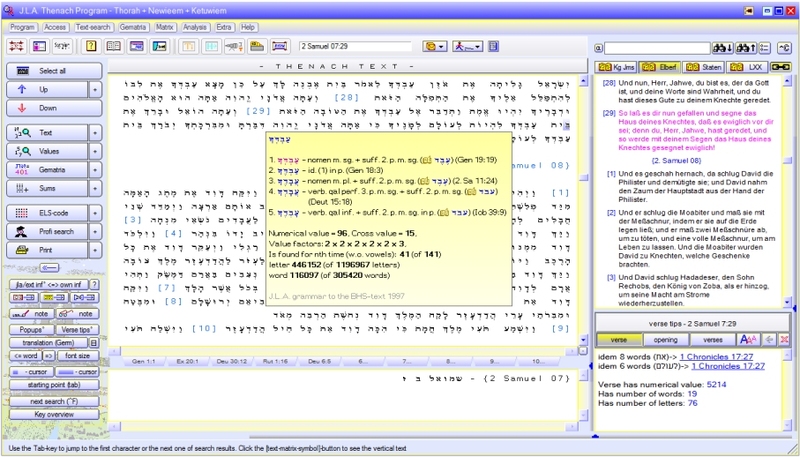 can be displayed with Hebrew or western text and numbers, so the program is also easily to use if one does not know Hebrew. A help window at program start offers a quick survey of the program structure and an easy start. Click on the themes left to learn the most significant possibilities.